Their is no way to sugarcoat it; the EU economy is in poor shape, and is steadily worsening. In the most recent quarter, it contracted by 2.5%, most in at least 13 years. [It very well could have been the worst quarter in 50 years, but Eurozone economic data was only compiled beginning in 1996]. Still, some economists continue to wear rose-tinted glasses: “Hopes rose…that the worst could be over for Germany’s economy as a closely-watched index measuring the confidence of financial market players rose to a near three-year high in May, its seventh consecutive monthly gain.” Added Axel Weber, a member of the ECB’s governing council, “‘There is definitely hope that the euro zone economy will gradually stabilise in the later part of 2009.” A more realistic analyst responds: “That points not to a revival but rather to a slower rate of GDP decline in the present quarter (it could scarcely get worse).” To prove that economists truly create their own reality, another confidence indicator that was released on the same day fell to a six-year low. Other analysts have found solace in EU labor markets, which remain relatively buoyant due to a lack of flexibility in hiring and firing. 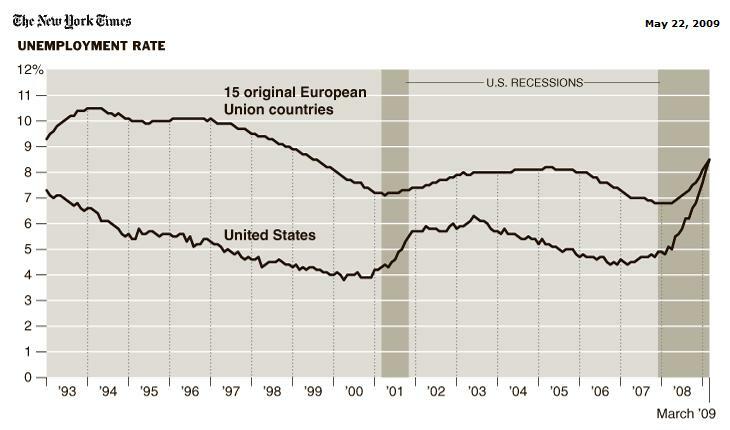 In fact, “Unemployment in the United States has risen to European averages, and seems likely to pass them when international data for April is calculated.” While this might be good news for workers, however, it negatively impacts GDP growth by preventing the economy from returning to a stable production base. The Euro, meanwhile, has never been stronger. 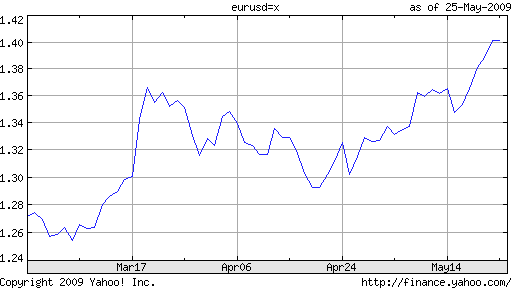 It has risen over 10% since touching a low against the Dollar on March 10, and recently broke through an important psychological barrier of $1.40. There are couple of explanations for this “contradiction.” The first is simply an application of the risk-aversion narrative. Simply put, “the euro is generally considered a risky bet on currency markets and therefore gains at times when there is greater perceived economic stability.” Recent trends suggest that financial market stability is more important than economic stability in the eyes of investors, but the idea is the same. The other explanation concerns inflation, or rather the lack thereof. The European Central Bank’s response to the credit crisis has been much more restrained than its counterparts, most of which are pumping money into credit markets with little concern about the future implications. Sure, the ECB has authorized a program to extend low-interest loans to member banks, and plans to purchase up to $80 Billion in corporate bonds, but these measures pale in comparison to what the Fed and BOE have announced. The ECB has also opted not to cut rates all the way to 0%, electing instead to hold its benchmark at 1%. Jean-Claude Trichet, head of the ECB, recently underscored that the role of the ECB is primarily to guard against inflation, rather than stimulate economic growth. “We are there to deliver price stability and price stability in the medium term is a crucial element in activating confidence,” he said. While there is certainly room for the debate as to whether this is economically sensible, Euro bulls can rest assured that their currency is being actively protected. « US Trade Deficit Nears 10 Year Low; Good News for USD?